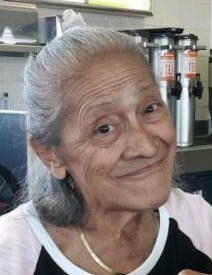 Amalia Reyna, age 73 of Beeville passed away on Thursday, March 28, 2019. Ms. Reyna was born on March 5, 1946 in Beeville to Juan and Luz (Sanchez) Reyna, Sr. She was a retired waitress, and a Catholic. She is preceded in death by her parents, four brothers; Juan Reyna, Jr., David Reyna, Refugio Reyna, Daniel Reyna, and two sisters; Rosa Ramirez, and Luz Cardenas. Survivors include two sons; Jesse Cantu, Juan Manuel Cantu, three daughters; Olga Cantu, Estella Garza all of Beeville and Anna Cantu Hudson of Frost, Tx., two sisters; Manuela Reyna of Victoria, Elva Hurford of Ohio, sixteen grandchildren, and a host of other relatives and friends. Visitation will be held at Trevino Funeral Home on Sunday, March 31st from 5:00p.m. – 9:00p.m. with a rosary beginning at 7:00p.m. Funeral Mass will be held at Our Lady of Victory Catholic Church on Monday, April 1st at 10:00a.m. with Father Luke, officiating. Interment to follow at Our Lady of Victory Cemetery #2. Active Pallbearers: Jesse Cantu, Juan Manuel Cantu, Michael Olvera, Daniel Cantu, Jr., Ricky Vasquez, Sarah Cantu, and Miguel Olvera.